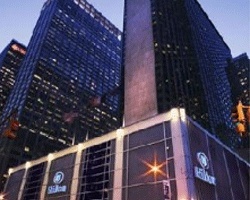 *Hilton Club New York* is centrally located in mid-town Manhattan at the corner of West 53rd Street and Avenue of the Americas. This resort and hotel is surrounded by famous landmarks, such as Radio City Music Hall, Rockefeller Center, Times Square, The Ed Sullivan Theater, Central Park, Carnegie Hall, Lincoln Center, plus many more! Featuring 47 newly renovated suites, all located between the 37th through 38th floors, Hilton New York sets the bar for resort luxury. Prime features include the restaurants New York Marketplace and Etrusca Ristorante, and the 8,000 square foot fitness center and spa. *RCI Gold Crown Resort* Featuring finely appointed floating accommodations. Annual usage is based on points, with 5,000 points per year included in the sale. RTU until 2032. Maintenance fees paid annually. For more information or to make an offer, please submit the inquiry form.